I remember visiting my grandparents every weekend when I was a little girl. I was always filled with excitement when I knew we were going over. My grandparents were my parent the first 3 months of my life because my mother got very sick after she had me. I guess you can say that is the reason why I had a special bond with them — not because they are my grandparents. My abuelo (grandfather) was the chef of the house. He would always create the tastiest meals ever. Everyone would come over just to eat his food. He cooked with lots of love and lots of flavor. It’s a shame I never sat down with him to write down his most famous recipes like his Bistec Encebollado (Steak & Onions). There was something about the steak that would just melt in your mouth. My mom never saw me eat as much as I did when he would make his steak recipe. It was one of the best steaks I had ever ate in my entire life and still, til this day, I haven’t had one as tastiest as his recipe ::sigh::. So even though I can’t give you my grandfather’s recipe (I would if I could), I found a very similar recipe on El Boricua.com that sounds just as good (almost). 2. Dump contents of bag in a heavy skillet and bring it to a boil. Cook over low heat, covered, for about 40 minutes or so. The meat will be very tender and tasty. Serve with white rice, pink beans and tostones. For more tasty recipes, please join the blog hop Sabroso Saturday at Latina on a mission.com. I like how this recipe is done boiling instead of frying. The plastic bag marinade makes it easy. In my house, we could probably split the work of chopping (and then combine everything). Ofelia recently posted..Merry Christmas to all! Mmm! How good that looks! Now I’m hungry! This is one of my husbands favorites but I’ve never done it like this before.. Thanks for sharing! Gracias/Thank you Lisa for the recipe and for linking up your sabroso/tasty recipe in the Sabroso Saturday recipe blog hop. you make me so hungry, It is cold here in Florida! My husband loves steak and he loves onions. He will love me even more if I make this for him! Vinegar is a natural meat tenderizer, marinading for a looong time will make it tender. 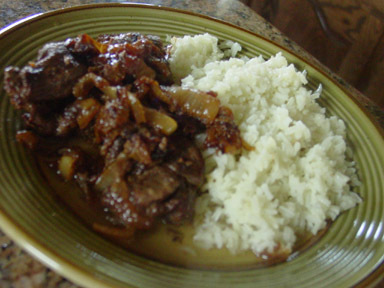 today is my 2nd time doing this recipe, got them marinating in fridge right now,im boricua and there is only one way im used to eat this back when i was in PR and this recipe brings good old memories,im a male and dont know how to cook at all but when is time for bistec encebollao im the chef for the day, at least with the bistec. When I was eight years old my family moved to Puerto Rico. I lived in Mayaguez for 10 years until I was eighteen and then moved back to Missouri to attend college. I always loved Puertorrican food and wondered how i would ever live without it. I made your biftec encebollado recipe today and it came out just like I remembered it at my work cafeteria and they were great cooks!! Thanks a million for your easy to follow recipe that tasted great. I am still trying to make the red beans to serve with rice but I can’t get a recipe quite right I remember the red beans has a piece of orange squash in it if you have any recipes for that let me know!!! Meanwhile I will be enjoying biftec encebollado!!! Thanks for stopping by and making the recipe! Do a google search for red beans – Im sure you’ll find a good one! thank you so much!! my mom does her steak boiled, and i been looking for a recipe and i couldn’t find one that didn’t involve frying the steak… i hope mine comes out as good as my mom’s.. her steak is always so juicy and tender. thank you so much!! !